The world is a big and scary place. Once you have a little one, it becomes even bigger and scarier. You realize with alarm there is really only so much you can do to protect them. It’s even more nerve-racking when one is a Black parent. In a society built on anti-blackness/hatred of black folks, you know your children are more vulnerable to violence/oppression by the dominate culture. By now, folks have heard about the black teen girl who was brutalized by a white police officer in the classroom. When I first saw the video clip, I immediately thought it would be on and popping if that had been my kid. Or maybe not. I most likely would just get arrested myself. Any excuse to lock us all up. As is the case of the victim’s classmate who was brave enough to record the attack and verbally let her anger be known about the incident. She is being charged with…who knows what. I guess daring to stand up to a white male authority figure? 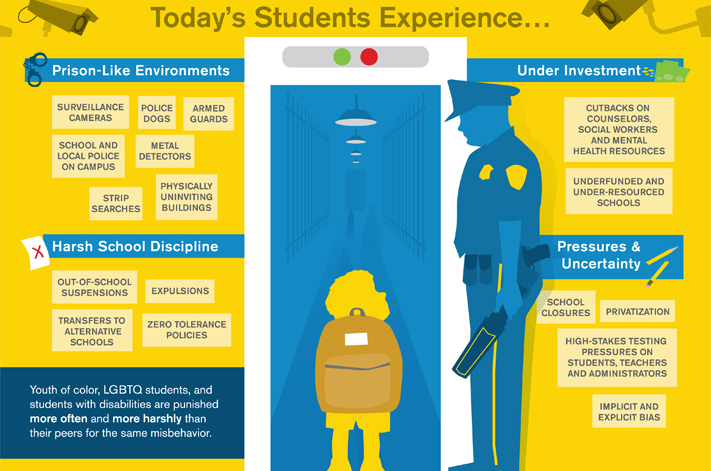 This is what folks mean when people talk about the school-to-prison pipeline. It’s been reported the teen suffered bumps and bruises as well as a broken arm. Really, a broken arm for having a typical teen attitude. Do you know how many times I rolled my eyes, smacked gum (well I’m old so I didn’t have a cellphone), but wrote notes to friends in class when I should’ve been paying attention to the teacher. Too many to count. Don’t let these teens lives be ruined over nonsense/white arrogance. Help get the charges dropped against them. Richland County Sheriff’s Department: 5623 Two Notch Rd, Columbia, SC 29223 (803) 576-3000 via Afro State of Mind.